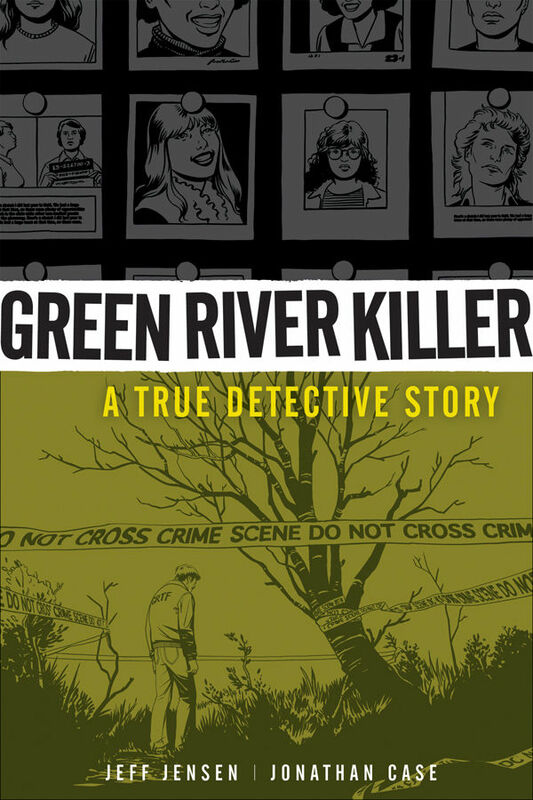 'Green River Killer: A True Detective Story' review: A crime story with real heart – AiPT! Explores a powerful story touching on modern cultural obsessions, the father-son dynamic, humanity’s dark side, and sick mustaches. Of all the many shared obsessions permeating our culture — CrossFit, Marie Kondo, the pH balance of one’s colon — serial killers prove to be the most personally confounding. No matter how shimmery my girlfriend’s coy smile proves to be, I simply can’t comprehend how someone like Jeffrey Dahmer is anything but a blight on the face of humanity (and not, like, a mischievous puppy). But then I read Jeff Jensen and Jonathan Case’s Green River Killer: A True Detective Story, and maybe there is something to our psycho obsession. Maybe. Yet this isn’t a story about Ridgway — it’s a love letter to Tom Jensen himself. We get to see this Jensen grow from an eager young seaman into this thoughtful, mustachioed policeman. Readers receive a first-hand look at the impact of Ridgway’s crimes on the psyche of a good and earnest man, and how that stands as a larger metaphor for our own relationships with these monsters. By shifting the role of protagonist to his father’s work, Jensen is telling a story about the larger emotional elements that go into these grizzly investigations. The cost, as it were, that comes with understanding the more primal elements of humanity. He shows us Tom Jensen as he both searches the woods for a body and also during jovial family dinners. In this way, all the space is removed, and we experience the burden of life as carried by Tom Jensen. Not just the depths of these secrets, but their impact across time and how that influences morals and worldviews. We may feel for him, and react viscerally to his circumstances, but Jeff Jensen doesn’t want people to pity his father. Instead, there’s just enough of a fictional spin to cast Tom Jensen as an unlikely superhero, a man with the courage and conviction to fight for justice, no matter how close he must dance with demons. As a result of the book’s focus and configuration, Ridgway’s role shifts a handful of times to suit the story. In some instances, he’s the big baddie, something to be feared above all else. At other times, through powerful conversations with Jensen, Ridgway is almost a secondary antagonist, and any pity or concern we may have is played up effectively without feeling hackneyed or forced. Yet other times, Ridgway’s more akin to a ghost, a shadow meant to hint at larger themes. A true personification of not just our own evils, but the idea that we’re closer to these feelings than we can admit or that so much of life centers on our understanding and conquering of these “urges.” Perhaps by structuring the book in this way, Jensen is further commenting on the genesis of our serial killer obsession — or at the very least, contextualizing the larger narrative to deliver meatier truths. It’s nigh impossible to talk about this book without comparing it in part to another crime-centric cultural obsession: True Detective. Both the book and the series not only drill down deep into the underbelly of society’s worst killers, but also employ flashbacks and the protagonist as a down-to-Earth, slightly flawed hero cop. One might even argue that these two franchises share elements like a sense of humor and commitment to emotional payoff and a general sort of mood. But whereas True Detective is definitely more cerebral and gritty, Jensen’s book feels like a proper comic book rooted in a complex reality. A huge part of that is Case’s artwork, which aren’t just your basic black and white sketches. These pages may be realistic — Jensen looks more like a tax accountant than Superman — but with a few flourishes of ink and the right angles, Case knows how to play up the emotion and the narrative openness to expand the scope of the book and the basic issues within. At the same time, what makes this book a success — a fantasy blended with harsh reality — is that the younger Jensen knows how to pace a story like few other creators in this detective genre. The book doesn’t always go for the most exciting or intense bits, and so much of it is dudes talking in a room (like Seinfeld, but with more strangulation). Yet in those interactions, Jensen gives enough depth and story to push everything forward. He may not always show you a dead body, but he builds a narrative that ensures those elements are always creeping mere inches from the surface. In no way do Jensen and Case hope to “solve” the issue of America’s love affair with serial killers. If you wear a Bundy t-shirt to bed (like my GF), then this book is clearly for you. If you’re more sensitive to the subject matter, you may end up reading Heathcliff instead. But if you approach the topic with neither overt obsession or moderate discomfort, what you’ll find is a solid book. One that is as touching and thought-provoking as it is existentially unsettling. Truly, a killer work (sorry, puns are my obsession). This second edition is a great chance to explore a powerful story touching on modern cultural obsessions, the father-son dynamic, humanity's dark side, and sick mustaches. A powerful tome balancing earnest emotions with gritty undertones. Exceptional art that builds and expands the emotional core. A great exploration of our obsession with evil. Perhaps not as appealing for those outside the detective fiction community. More cheese and heart than blood and gore (yes, that's a partial downside).